The belted kingfisher is a stocky, medium-sized bird that measures between 28–35 cm (11–14 in) in length with a wingspan of between 48–58 cm (19–23 in). This kingfisher can weigh from 113 to 178 g (4.0 to 6.3 oz). The adult female averages slightly larger than the adult male as well as more brightly colored. The Megaceryle large green kingfishers were formerly placed in Ceryle with the pied kingfisher, but the latter is closer to the Chloroceryle American green kingfishers. The belted kingfisher’s closest living relative is the ringed kingfisher(M. torquata), and these two in all probability originated from an African Megaceryle which colonized the Americas. This bird’s breeding habitat is near inland bodies of waters or coasts across most of Canada, Alaska and the United States. They migrate from the northern parts of its range to the southern United States, Mexico, Central America, theWest Indies and northern South America in winter. During migration it may stray far from land; the species is recorded as an accidental visitor on oceanic islands such as Clarion, and has occurred as an extremely rare vagrant in Greenland, Ireland, Netherlands, Portugal, and the United Kingdom. 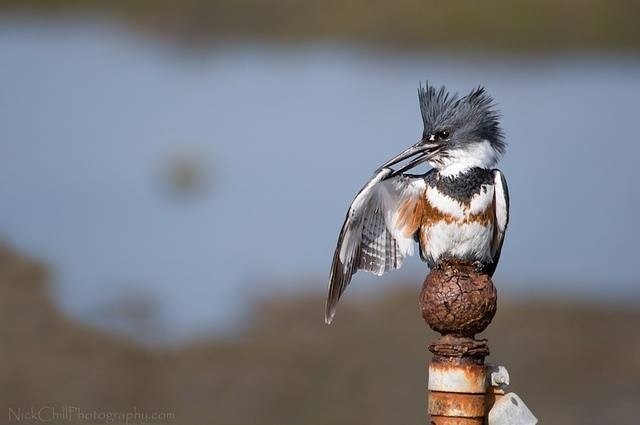 The belted kingfisher is often seen perched prominently on trees, posts, or other suitable “watchpoints” close to water before plunging in head first after its fish prey. They also eat amphibians, small crustaceans, insects, small mammals and reptiles. This bird nests in a horizontal tunnel made in a river bank or sand bank and excavated by both parents. The female lays five to eight eggs and both adults incubate the eggs and feed the young. 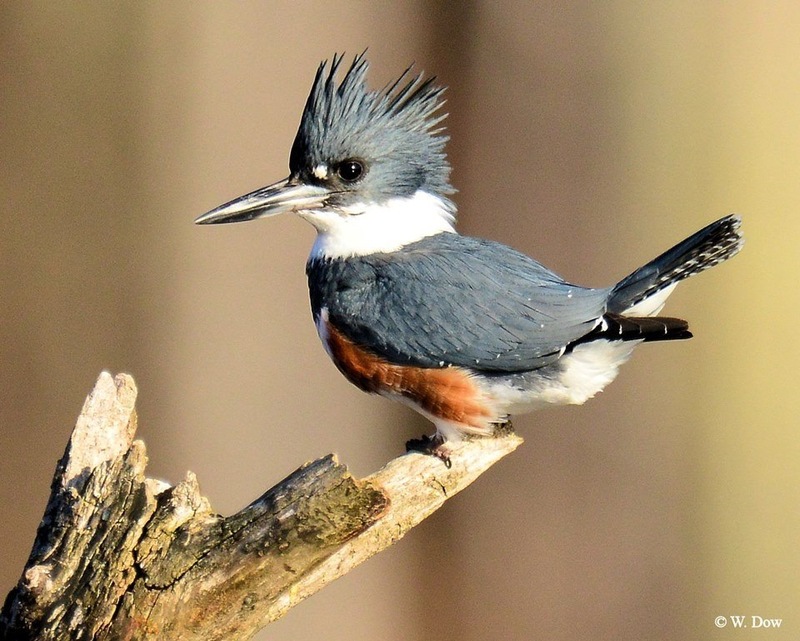 The nest of the belted kingfisher is a long tunnel and often slopes uphill. One possible reason for the uphill slope is in the case of flooding the chicks will be able to survive in the air pocket formed by the elevated end of the tunnel.